Why do men need men’s groups? Men generally grow up seeing other men as competitors, and mostly have poorer support networks and interactive skills than women. Perhaps that was useful when fighting for the last bison on the plains, but it doesn’t help most men in 2015. These days, most of us need high emotional intelligence and collaboration skills just to get through the average week. For men, these talents need to be learned in adult life, but where? Men’s groups provide a safe, supportive space for what can be a vulnerable process. I have been co-leading men’s groups for 20 years, and I am repeatedly moved by how the safety and simplicity of a circle of men is so affirming. Women don’t realise how much self-doubt most men ca rry: in a group of men, the first big gift is realising you are ok and accepted as you are. It’s also a great place to learn how to express, hear and interact with feelings. A weekend retreat with no more than twenty men is long enough for a deep exploration, and there’s also a lot of fun and playfulness that emerges when a bunch of men, even strangers, feel free and safe. 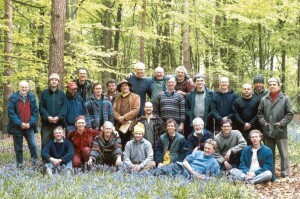 Hazel Hill is a 70-acre conservation woodland retreat centre, near Salisbury, which I’ve been running since 1987. Being outdoors with plenty of space to hang out together round a fire, roam alone, or do some physical conservation work, is an ideal setting for men’s groups, and this wood has been used by many over the years. On the August bank holiday weekend, I am co-leading a men’s group at Hazel Hill with Nick Mabey. Nick has lots of experience with Mindfulness, and almost none with men’s groups, and I’m the opposite. We’re excited by this combination, and because even we don’t know what we’ll be doing. Our aim is to create a sense of fellowship among the group and with the wood, and then explore the issues and questions which are hot and current among us.